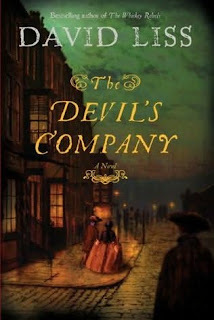 From the acclaimed author of The Whiskey Rebels and A Conspiracy of Paper comes a superb new historical thriller set in the splendor and squalor of eighteenth-century London. In Benjamin Weaver, David Liss has created one of fiction’s most enthralling characters. The year is 1722. Ruffian for hire, ex-boxer, and master of disguise, Weaver finds himself caught in a deadly game of cat and mouse, pitted against Jerome Cobb, a wealthy and mysterious schemer who needs Weaver’s strength and guile for his own treacherous plans. Weaver is blackmailed into stealing documents from England’s most heavily guarded estate, the headquarters of the ruthless British East India Company, but the theft of corporate secrets is only the first move in a daring conspiracy within the eighteenth century’s most powerful corporation. To save his friends and family from Cobb’s reach, Weaver must infiltrate the Company, navigate its warring factions, and uncover a secret plot of corporate rivals, foreign spies, and government operatives. With millions of pounds and the security of the nation at stake, Weaver will find himself in a labyrinth of hidden agendas, daring enemies, and unexpected allies. So, here I am back in Georgian England! How comforting to be home once again :-) I thoroughly enjoyed David Liss's previous books featuring Benjamin Weaver, a Jewish ex-boxer making his way as a detective in London. (And yes, I mention the religion for a reason. Judaism is part of all Liss's novels historical novels, and while it is never at the forefront of the plot, it is definitely a key component of the background.) I admit I don't remember the first two very well at all- I read them some years ago- but I do remember liking them. So I was really excited to get this book through LibraryThing's Early Reviewers program, and I wasn't disappointed at all. David Liss, the author, is studying to get his PhD in history, and this comes through in his books. They are all very well-researched. He knows early 18th century England well, from London's neighborhoods to the political maneuverings of the East India Company. He is also very realistic in his portrayal of characters. He does notgive his characters modern sensibilities. I really appreciate that in a historical novel because frankly, that's the point of reading them. I don't need to read about 18th century London if everyone populating the book's pages has the same thought process that I do. Some say that Liss gets a bit bogged down in the background research and presents too much of it in his stories to be interesting. I admit that at times, there is a lot of political talk, but personally, I'm a fan. However, this is my favorite period in history, so I could be a bit biased. One thing that did seem to ring false, though, was the East India Company corporate slant. I understand that the East India Company was the first multi-national corporation, really, complete with stockholders. I also understand that the directors of the firm, and people further down the ladder, were very ruthless in their methods to get as much profit as possible. However, I do think that Liss put a slightly too modern slant on the way everyone reacted to the company in the book. It was pretty clear to me that Liss was writing to an audience that is currently going through a global recession in which corporate greed featured prominently. It's all well to assume people now should know about corporate responsibility and the effects capitalism can have in many sectors. But I don't quite buy into the way everyone in 1722 seemed just to know what would happen to the East India Company, Britain, and the world, when it was the first-ever corporation. That concern didn't hamper my enjoyment of the novel, though. It is fast-paced, populated with interesting characters, and fun to read. Another historical mystery winner. This does look good. I liked The Coffee Trader. I have been meaning to try David Liss for ages. I think I borrowed one once but didn't get to read it. My word verification is undia! I have his other book, The Coffee Trader on my shelf, but haven't read it yet. I am really glad that you liked this one because I have been looking at it and thinking about grabbing a copy when I can. It sounded like a really smart historical read, and your review confirms that. Thanks! !